THE ATTACK UPON THE GILBERT ISLANDS was an early experience in amphibious operations and the first atoll operation in the Central Pacific Area. Men, materiel, and methods were chosen in a series of crucial decisions by a planning staff which had to anticipate every aspect of the operation. Once the landing forces arrived at their objectives, 2,000 miles from base, they had to win with what they brought. Planning was undertaken by several staff groups. The general staff of the Commanding General, Central Pacific Area, that of the Commander-in-Chief, Pacific Ocean Areas (CinCPOA), and that of the 27th Infantry Division were all implicated. The staff of the 27th Division were acquainted with their mission in a joint conference with the staff of CinCPOA, early in August 1943, and set about studying a reorganization to fit its requirements. The whole operation was given the code name Galvanic, and the Army portion was designated as Kourbash. Tarawa, Nauru, and Apamama were first selected as the objectives. The Army's mission was to be Nauru. For the next two months, 27th Division planning centered upon Nauru. on 28 September. Abruptly its planning was transferred to capturing Makin. Only six weeks remained in which to get ready. of 16/17 August 1942 added more useful data. To Oahu came two former residents at Makin, Lt. Comdr. Heyen of the Royal Australian Navy and Pvt. Fred C. Narruhn of the 1st Fiji Infantry. The latter bad been born on Makin; both were to accompany the expedition. With these new sources of information, new plans were devised which fitted the conditions at Makin. Makin atoll is an irregular formation of reefs and islands around a large lagoon, approximately triangular in shape (Map No. 3, page 8). The northern side is a reef 17 miles long, running east and west between islands, The western side, about 14 miles from tip to tip, consists of small islands, a reef broken by several channels into the lagoon, and the western end of Butaritari Island. The remainder of Butaritari, and the island of Kuma northeast of it, stretch for some 13 miles to the eastern corner of the atoll. The main passage into the lagoon runs through the reef at its southwest corner, passing just north of the northwestern tip of Butaritari. Another near the northern corner is sufficiently deep but is almost blocked by islets in the lagoon. Other channels are suitable only for small boats. Numerous islets are scattered about the inland water, so that navigational difficulties and beach conditions alike favor the use of the southwestern portion for anchorage. None of the other islands is as large or important as Butaritari, on which the Japanese had developed a seaplane base. 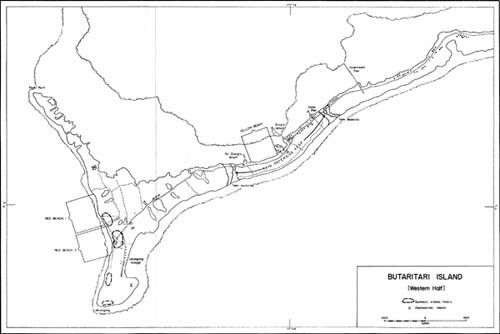 Butaritari is shaped like a long, bending ribbon; its western end resembles a fishtail, or the armrest of a crutch, with two main points projecting westward from the central shore, forming there a shallow curve, As one goes eastward from this shore, the main body of the island narrows abruptly. It averages 500 yards from ocean to lagoon, and at some points is much less. Butaritari and Kuma are connected by a reef, one side of which is high enough to permit crossing on foot at low tide. BUTARITARI from the southwest as seen from navy bombers opening the action on D Day. At left are Red Beach 1 (A) and Red Beach 2 (B). The West Tank Barrier clearing (W) and Yellow Beach (Y) appear at right. Later site of our artillery on Ukiangong Point (U). beaches, was satisfied that "landing boats could get ashore there at any time." The lagoon reef was also deemed to be no obstacle. "LST's (Landing ship, Tank) could stem the edge of the reef at low water springs, to effect the direct landing of vehicles. LCI's (Landing Craft, Infantry), DUKWs, and Alligators could get ashore at all states of tides," according to their estimate. The islands are so flat that they afford no natural points Of observation, and so low that after rains, extensive areas, especially in the west, are covered by shallow ponds surrounded by marshland (Map No. 4, p. 13). Butaritari and Kuma Islands were those on which the natives lived the year around. Before the war copra had been the principal export; coconut palms are widely dispersed but at various points so predominant as to seem like cultivated groves. For food the natives raise bobai plants, which they grow in pits. Bobai pits were known to be more numerous near the villages. With soft banks and mucky bottoms from which the vegetation rose several feet to a level approximating that of the growth around them, these pits were recognized as substantial obstacles to foot soldiers and tanks. Their exact locations were unknown. Elsewhere, especially along the lagoon shore and at the edges of the ponds, mangroves and salt brush are found. The terrain seemed likely to limit vehicles more than it would the foot soldiers, who could move forward under the ceiling of coconut palm branches or through the clearings and marshes, even if with difficulty. Inland from the western shore the firmest route for vehicles was the island highway and the lagoon beach. At low tide the reef itself is bared and could be used for the passage of wheeled vehicles. The island's main highway is unpaved and narrow at most points. Crossing the marshes it resembles a causeway bordered by coconut palms. In the villages which it connects, it widens to two laces along the grass-roofed huts. It is made of coral sand and is well-drained. From Ukiangong village on the southwestern point, it runs northeastward to the lagoon shore and along that to the eastern end of the island; its route passes, therefore, through Butaritari village, near the island anchorage, across the bases of the four wharves which jut into the lagoon near the anchorage, and through the eastern village of Tanimaiaki. About 1,700 islanders, Melanesian and Polynesian, were known to live on Butaritari and Kuma, and with them, before the arrival of the Japanese, a score of Europeans and halfcastes. Scattered hamlets are connected with the main highway by secondary roads and traits. In the central portion of the island, such a narrow, unsurfaced road runs close along the ocean shore, and is connected with the main highway by cross-island roads. Paths and trails branch out to points and coves, but except for a few, their location was not known to the invaders before the occupation. Air photographs of Butaritari Island revealed certain features very clearly. About 3,000 yards from the western end of the island lay a clearing from lagoon to ocean, a bare strip within which an antitank trap had been dug for most of its length. Its counterpart lay eastward approximately two more miles, crossing the island somewhat west of its center. Between these two clearings the Japanese were known to have concentrated their principal installations and to have built their main defenses. Between them, also pushing out into the lagoon, the photographs showed three wharves of varying length, while a fourth, east of the easternmost clearing, ran from a point outside the fortified area. The westernmost pier runs from a base about 300 yards east of the West Tank Barrier. Known as On Chong's Wharf, it was built like the others by the British as a high-water structure, for it extends only 400 feet and is unusable at low tide. One thousand yards further east is King's Wharf, the main structure, projecting 1,000 feet into the lagoon and thus clearing the reef. At its tip it has several spurs, to one of which the Japanese attached two seaplane ramps. Between its base and that of On Chong's Wharf, a wide sandspit protrudes sufficiently to create a small cove rimmed by a smooth sandy beach adjacent to King's Wharf. Some 800 yards farther east, the third wharf springs from a wide base. Like On Chong's Wharf, this structure, which was known as Stone Pier, is dry at low tides, for it is only 500 feet long. At the base of each of the wharves and on the sandspit were buildings, some of which had been erected in the days of British occupation. A concrete church which had protected Carlson's Raiders from Japanese light gunfire lies about 200 yards southwest of Stone Pier, and a long concrete native hospital is located along the beach northeast of Stone Pier. A fourth pier, long, but of inferior construction and damaged by storms, was left outside the "citadel" area by the Japanese when they planned the fortifications. Although it stretched 1,750 feet into the lagoon from a point 1,250 yards eastward from Stone Pier, it had not seemed worth repairing and using. The East Tank Barrier was therefore constructed just beyond the base of Stone Pier, about 1,000 yards short of this Government Wharf. Japanese had greatly increased their installations and defenses, but the trees and other concealment left the exact character of these works to be ascertained by the invaders in the course of the assault. of the island is reduced to 150 yards, despite the projection of a knob into the lagoon opposite one part of the Bight. Although estimates of the number of Japanese forces on Makin varied, the 27th Division anticipated finding there 800 troops, operating 4 heavy and 4 medium antiaircraft guns, from 20 to 40 machine guns, and the rifles of one company. The enemy's prepared positions were understood to be in the area south of the wharves between the two tank barrier defense. systems, and in an outer perimeter paralleling the shore at the western end of Butaritari. The operations' overlay map for invasion from the Red Beaches circled four strongpoints at fairly regular intervals from the land separating the two Red Beaches to the southwestern point (Map No. 5, p. 14). Ukiangong village was also reported to be the site of military activity, probably defended by several machine guns. The proximity of Makin to the airfields and seaplane bases at Tarawa, Mili, Jaluit, Maloelap, Wotje, Nauru, and Kwajalein made enemy air strikes from them a possibility. At Makin itself observers on the submarine Nautilus had found considerable air activity in October. Invasion there would thus be carried to success only if enemy airpower had been neutralized by blows at his bases or by interception and antiaircraft during the operation. Weather conditions suitable for air operations could be expected for at least part of November. Normally, weather changes in the equatorial belt are slow and are predictable for several weeks in advance. When the equatorial front moves south it introduces a period of doldrum weather. The limitless ceiling and excellent visibility which prevail before this change would not only aid bombing operations but would deny cover to the Japanese either for air raids or for an approach by units of their fleet. Naval operations would also derive benefit from the conditions which could be expected for much of November, since the steady easterly winds furnished an isothermal belt of surface water conducive to good sound-detection of enemy submarines. After the doldrum period the prevailing winds upon Makin would become strong westerlies, making landing on the western beaches impossible. 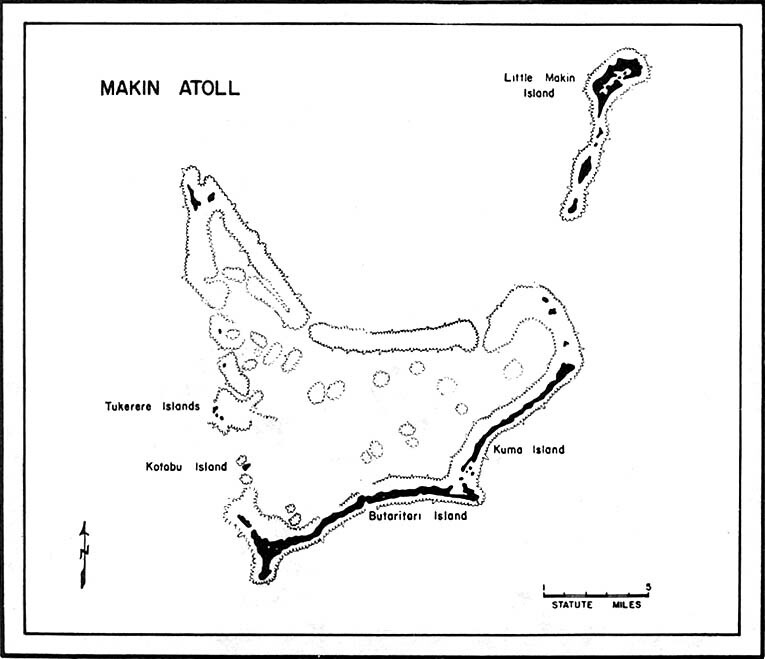 Four miles east of Makin lay Little Makin, a satellite atoll of small proportions on which Japanese outpost installations might exist, but on which no significant military activity had been noted in reconnaissance by air and submarine (Map No. 3, p. 8). 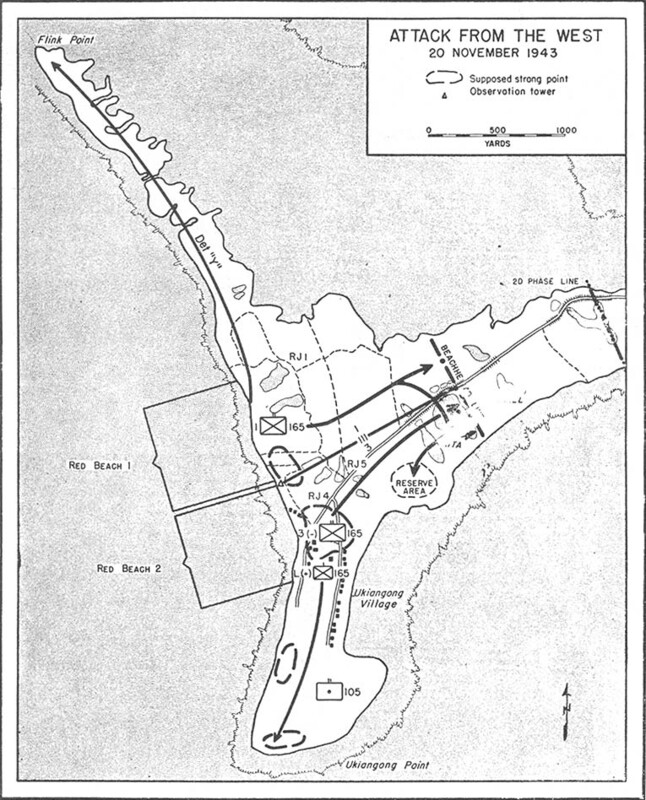 To fulfill the mission of capturing Makin and eliminating the Japanese required: first, an attack upon the island which contained their prepared positions; secondly, control of Kuma and other smaller islands on which outposts might be placed; and finally, pursuit of the enemy to all the lesser points of refuge for enemy troops which might Le from Butaritari. As a precautionary measure, it also involved early air reconnaissance over Little Makin and the possible dispatch of a small force. Possession of the captured atoll might then be transferred to a garrison force whose mission it would be to convert Makin from a Japanese seaplane base to an American station for shore-based airplanes. 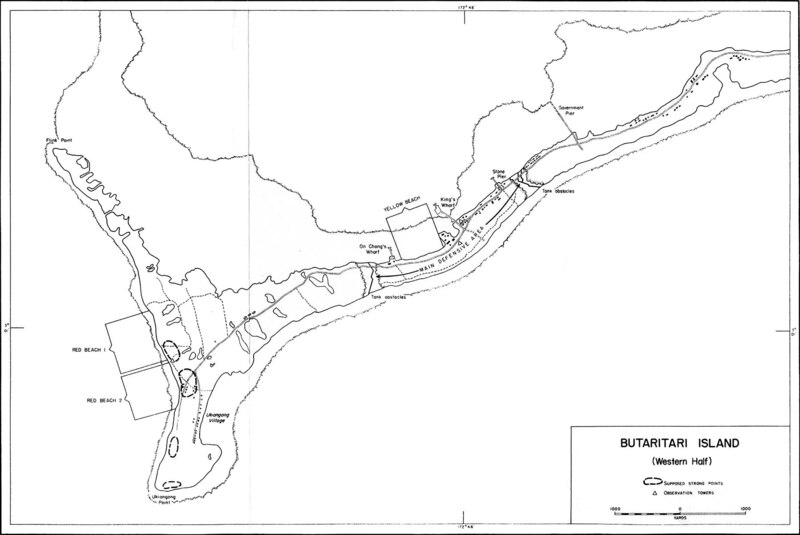 The major field of operations for the invaders was necessarily the island of Butaritari. Landings at Makin and Tarawa, 105 miles away, were planned to begin simultaneously by two separate landing forces from Task Force 54, Rear Adm. Richmond K. Turner, commanding. Arrayed with them as elements of the Task Force were support and air support groups, a minesweeper group, transport and LST groups, and a garrison force. At 0830, 20 November 1943, the first landing craft were to touch the beach at each atoll. While the 27th Division Landing Team, with attached units, took Makin, the 2d Marine Division was to assault Tarawa, leaving one of its combat teams in reserve for the support of one or both operations. If this reserve remained uncommitted, it was later to occupy Apamama. 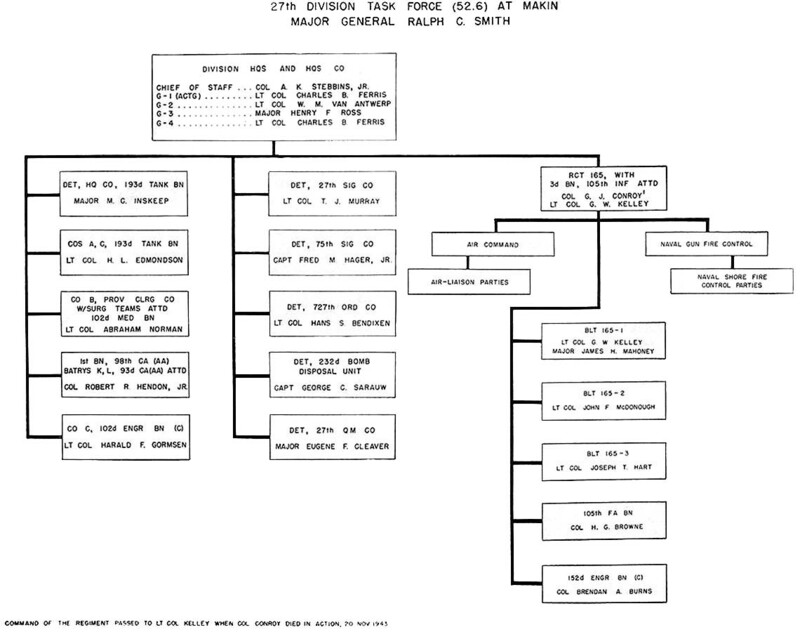 The assaulting force at Makin was to consist of the 165th RCT, less the 2d BLT, which was designated as a reserve landing force during the first stage. Once the beachheads were secure, command would pass from Admiral Turner to the senior troop commander and would apply to all shore-based land, sea, and air forces. When capture was complete, command of the island was to be transmitted to the garrison force commander, and the landing force was to be removed. interval of about two hours. The western beaches were designated as Red Beach 1 and Red Beach 2, and on them, at 0830, the 1st and 3d BLT's were to commence penetrating the island side by side, each being led by a special landing group in 16 Alligators. If all went well according to plan on the Red Beaches, at 1030 a second landing was to be made on the lagoon shore, among the piers, on what was known as Yellow Beach (Map No. 4, p. 13). The second landing was to be made by the 2d BLT, following to the beach another special landing group, and was to be supported by the medium tanks of Company A, 193d Tank Battalion and their 75-mm guns, If the first landing met with unexpectedly successful opposition, the landing on Yellow Beach could be postponed and instead, the 2d BLT would be committed in support of the other two battalions on the Red Beaches. 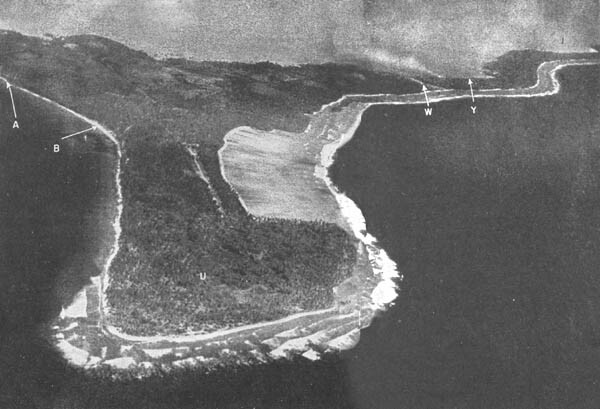 Bombers of the Seventh Air Force, temporarily operating under Navy control, were to soften up the island during the week preceding the attack, to provide photographic reconnaissance on the last day before the attack, and to strike Nauru and air strips in the Marshalls from which the Japanese might send aid during the action to their force on Butaritari. Navy carrier-based bombers would support the landing operations, dropping half-ton and one-ton demolition bombs and one-ton "daisy-cutters" for the first half-hour of daylight upon coast artillery positions, heavy antiaircraft guns, pillboxes, housing installations, stores, and personnel. They were to strike first the area from the West Tank Barrier eastward to the vicinity of Government Wharf. At 0615 this activity was to cease, but the carrier planes would maintain daylight air patrols, submarine reconnaissance, morning and afternoon search flights, artillery spotting, observation liaison, and light bombing and strafing as needed throughout the operation. West Tank Barrier into which only patrols might advance before the barrage was lifted. 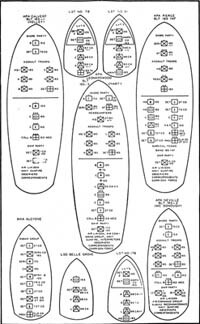 The prearranged firing plan called for a total of 1,990 rounds of 14-inch, 1,645 rounds of 8-inch, and 7,490 rounds of 5-inch shells from four battleships, four cruisers, and six destroyers: in all, 1,717 tons of projectiles. Half the shells were fitted with delayed-action fuses to permit penetration among the thick coconuts before detonation. When the first wave of boats was 800 yards from the Red Beaches (according to schedule, at 0825), carrier-based fighters were to strafe the beaches and the area 100 yards inland and 500 yards north and south of the beaches' extremities. Then, as the boats reached a point 100 yards from the shore, the fighters were to withdraw while bombers returned to hit every defense installation within 500 yards to 1,000 yards inland from the beaches, all the way across the island from north to south. They were also to strike every evident activity on Ukiangong Point, paying particular attention to mortars, pillboxes, and installations which could register on the Red Beaches, and using 100-lb. and 500-lb. demolition and fragmentation bombs. Fifteen minutes after the first wave had landed (if the schedule were strictly adhered to, at 0845), the bombers were to yield the field to the naval gunners. At 0850, the warships would resume scheduled fire upon tank barriers, gun positions, and the highway. The same pattern of bombardment, strafing, and bombing was to precede the attack at Yellow Beach, but there, extra caution was needed to avoid dropping bombs among friendly troops. ganize, extend across the island, and take over the whole line white the 3d BLT at the right would drop back and go into divisional reserve. Patrols were to be sent forward after reaching the line but the second phase of advance was to wait until 1030. Thus the advancing 1st BLT would keep clear of naval shells falling near the West Tank Barrier during the prearranged fire before the Yellow Beach landings. ALLIGATORS AT MAKIN were used to carry the first assault troops ashore, to convey wounded to the transports, serve as ferries from barges unable to clear the reefs, and take troops on special trips to outlying islands. Here one drags a pallet to Yellow Beach at low tide. (Landing Vehicle, Tracked), popularly called "Alligators," were to move at once to the flanks and there establish positions defending the beaches. Only one platoon was to man the position on the left flank of Red Beach, the remainder proceeding out the narrow Flink Point, over a shallow water passage which separated part of it from the remainder, and clearing all hostile forces, At the southern end of the western beaches, on the right flank of Red Beach 2, the special detachment was to leave one platoon in charge of the position while the remainder joined Company L, 165th Infantry, and light tanks of the 193d Tank Battalion in clearing Ukiangong Point to its tip. Batteries of antiaircraft artillery (93d Coast Artillery (AA) less automatic weapons platoons) formed part of each of the BLT's, going in over the Red Beaches. Additional antiaircraft protection was to arrive on D + 1 when a provisional antiaircraft battalion of the 98th Coast Artillery (AA) came to serve as part of both the assault and garrison forces. It was to remain in floating reserve, prepared to land on divisional order. The field artillery batteries which went ashore with the BLT's were to pass at once from battalion control and to take positions obtained for them on Ukiangong Point. From there they were to deliver supporting call fire upon any point under attack during the first day or two. While the larger assault from the west was in its first stage, a special landing detachment in two landing craft was to take Kotabu Island, off Flink Point (Map No. 3, p. 8). A platoon of marines with a reinforced infantry platoon from Company G, 165th Infantry, was to execute this mission after preparatory naval bombardment of the little island. The detail was to destroy the enemy forces found there, and on any of the other islets on the western side of the Makin triangular lagoon. Passage between the island and Flink Point would thus be secured from close-range enemy fire. If the landings at Red Beach succeeded, that scheduled for Yellow Beach could then take place. cutting across the island from lagoon to ocean. While part of the assault would then become a holding action on the left, the main effort would be on the right toward the West Tank Barrier. Since the 1st BLT would be advancing eastward, the barrier would be enveloped from front and rear. When that fortification had been taken the holding action on the left would be superseded by a strong drive eastward the length of the island, traversing the narrow, twisting ribbon of marsh and grove to its last sharp point. Special landing parties would be detached for the seizure of any outpost islands and the destruction of enemy units. A feature of the plan was the availability, by afternoon, of supporting howitzer fire from the field artillery battalion on Ukiangong Point. (See illustration, p. 10.) It was to cover any part of the main defensive area on call and was expected to be of great value, especially if the preparatory bombardment had not fully neutralized Japanese defenses. Such was the structure of the tactical plan for the operation on Makin. COMMAND OF THE REGIMENT PASSED TO LT COL KELLEY WHEN COL CONROY DIED IN ACTION, 20 NOV. 1943. Although the 27th Division had anticipated taking part in some aggressive operation in the Central Pacific Area, and had trained for beach landings and jungle fighting since coming to the Hawaiian Islands, the imminent arrival of actual combat encouraged intensive training for Makin. jungle woodcraft, jungle lore, and tropical hygiene were now studied. Weapons training and practice with live hand grenades were emphasized for all combat troops. The field artillery, tank battalion, and infantry each conducted range firing of all their weapons, From small unit problems in jungle fighting to battalion and regimental combat team exercises, the troops reviewed what was involved in daylight attack in close terrain, hasty and prepared defenses of a position, night operations, perimeter defense, day and night withdrawal, the attack of fortified positions in jungle terrain, and the elimination of snipers. Amphibious training with floating equipment, practice in swimming and staying afloat fully clothed and wearing an infantry pack, unloading and loading supplies, and finally, ship-to-shore rehearsals under naval gunfire and air bombing, controlled by shore fire control parties, completed the realistic exercises. 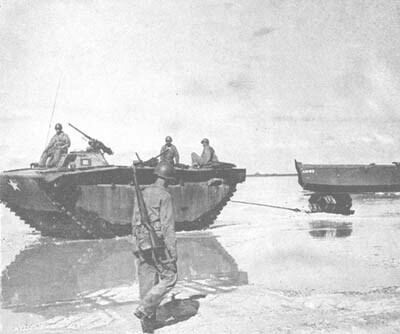 General Ralph C. Smith and some of his staff were convinced that the initial forces to cross the beaches of Makin should be carried ashore in LVT's (Alligators) , amphibian tractors capable of self-propulsion on water and on land. Each of the 3 landing groups which first approached the 3 separate beaches on Butaritari was to ride in 16 Alligators. To operate the vehicles, personnel was drawn from the Headquarters Company of a tank battalion. Behind this first element in the invading forces they planned to send a platoon of tight tanks, and, on Yellow Beach, an additional force of medium tanks. These heavy units would be brought to shallow water by LCT's (Landing Craft, Tanks), blunt-nosed lighters of relatively shallow draft. A detail of the 193d Tank Battalion began working with the landing teams on 15 October to develop the skill needed to operate and maintain Alligators. They had but one LVT on which to practice, and when those for the Makin landings were delivered on 30 October, they were of a longer, later type, lacking not only armor but necessary armament. They had to be conditioned for use in great haste while machine-gun mounts were obtained for them by stripping some of the armed vehicles on Oahu. Time for training with the transports was very short indeed. Time was also insufficient for infantry and tank crews to achieve adequate effectiveness in cooperation before the actual operation began. Communication between crews inside the tanks and infantrymen outside them was an unsolved problem; another was the method by which infantry officers could bring tanks directly into support. Materiel and supplies for the Northern Landing Force were, like the force itself, controlled by available transport and by the nature of the mission. The expedition was equipped with jeeps and trucks, but in numbers deeply cut from the Tables of Basic Allowances in order to save both their room and that of fuel to operate them. The communications plans required, in addition to telephone and telegraph sets, switchboards, miles of wire on reels of various types, and a considerable quantity of radio equipment. Radio sets were to link the various levels of command, afloat and ashore, the infantry, field artillery, naval gunfire, air, and tank support, the beach parties, and the air observers. They ranged in size from the 6-lb. portable SCR-536 to the 275-lb. SCR-608, and the trailer-borne SCR-299. Two radar sets were brought to furnish air warning. To clear beaches, haul supplies, and draw artillery pieces into position, 38 tractor bulldozers were taken by the attacking force. Of these, two D-7's and four R-4's were for use at each of the three beachheads, and one R-4 was for the combat engineer platoon attached to each BLT. Ali were waterproofed under the guidance of the 13th Engineer Combat Battalion, 7th Division, which had landed at Attu. The engineers also brought one 10,000-gallon and five trailer-mounted 2,000-gallon units for distilling water, and three paving smashers for excavating in coral. 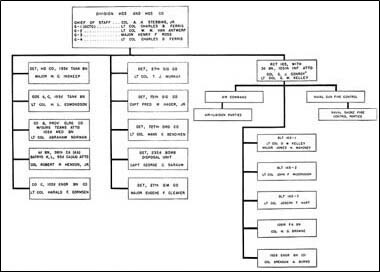 The divisional G-4 staff section had previously formulated, for whatever overseas mission might require, embarkation of the entire division, a careful table of supply requirements and their cubic content, and a loading plan with orders of priority. These data proved useful in the highly complicated task of loading and stowing cargo for the expedition. The Task Force commander, Admiral Turner, insisted that the cargo be stowed in such a fashion that the load be evenly balanced in each ship. 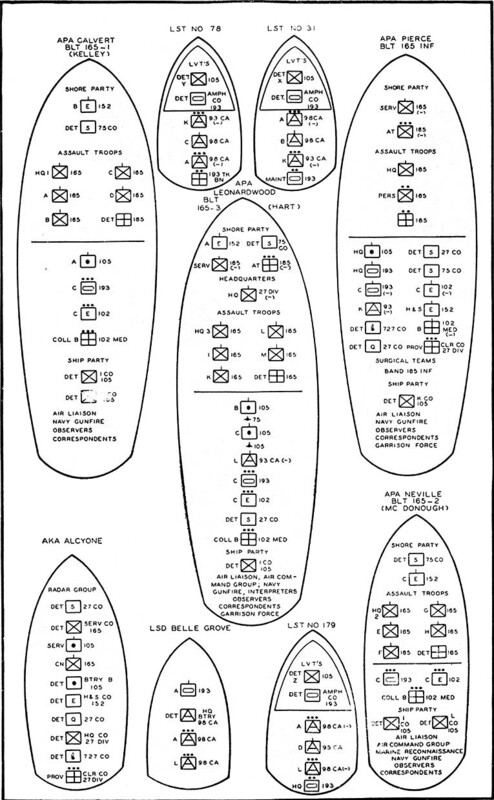 The 27th Division staff was primarily interested in combat loading, an arrangement which would link materiel with personnel, ship for ship, each vessel carrying what its occupants would need in battle, and at the same time would load it in layers of relative urgency, so that the lowest would be the least necessary rather than the heaviest. The requirements of seaworthiness and navigability clashed in some degree with those of maximum efficiency in supporting land combat. Adjusting these conflicting requirements was difficult, but was accomplished by altering the plans to which Admiral Turner objected without departing from the combat-loading principle. Another logistics problem was met by pallet loading, a practice which had been tried at Attu with inconclusive results. To make possible the unloading and removal of supplies with a minimum of delay while under enemy fire, and to achieve some other lesser advantages, the 27th Division adopted the pallet system for the Makin operation.1 Pallet loading is prodigal of cargo space, and in the Gilberts expedition, left unused about 46 percent of the basic ship tonnage capacity. Naval officers at Oahu were understandably opposed to a practice which seemed so wasteful. 1. Pallets are large units of supplies or ammunition which can be hoisted or lowered in slings, kept intact while on shipboard or in small craft, and dragged ashore. The packages are fastened together and to a sled- or toboggan-like base by metal straps. In favor of pallet loading, however, was not only the reduced exposure to enemy fire for those unloading at the beaches, but also the smaller number of men needed to do the unloading. A larger proportion therefore was free for combat. Although cargo space went unused, of the cargo which was brought ashore, much less was wasted because the sleds kept perishables above the mud and water and permitted the drawing of cargo units swiftly to the supply dumps. (See illustration, p. 19.) Ammunition handling and rehandling could also be curtailed. In the end, in consultation with a naval officer who had made a special investigation, 1,850 41 x 61 pallets of two types were adopted. Each BLT was to be loaded on its own transport with most of its landing craft, Headquarters and other units went on a fourth APA (Transport, Attack). The radar detachment, with its heavy trailers, and various service detachments were to ride on an AKA (Cargo Vessel, Attack). Medium tanks were to be carried, with their lighters" on an LSD (Landing Ship, Dock), and 3 LST's would take the 3 special landing groups, each with its 16 Alligators. Thus nine vessels were to carry the Makin force from Oahu to the target area. During the first week of November 1943, the final stages of planning and training reached their conclusion. The forces organized to capture Makin and develop it as an American base were gathered for embarkation. Hurried and incomplete as their preparations in some fields had necessarily been, the time had come for the expedition to move. The first aggressive drive toward Tokyo in the Central Pacific Area was about to begin.